Chennai : Squeaks coming from the bag of a passenger from Bangkok at the Chennai Airport made the customs officials suspicious and on checking found a leopard cub. The passenger who was trying to smuggle in the leopard cub has been arrested on Saturday at the Anna International Airport. Commissioner customs Rajan Chaudhary said officers of the Air Intelligence Unit (AIU) noticed a Kaja Moideen, who flew-in from Bangkok by Thai Airways, moving in suspicious manner and confronted him. He was seemingly in a hurry to get out. The officials also heard trill sound coming from his bag and when queried Moideen was evasive in his replies. The officials opened the bag and found a pink plastic basket in which a leopard cub was found in a state of shock. The customs officers fed the cub with milk in a feeding bottle. 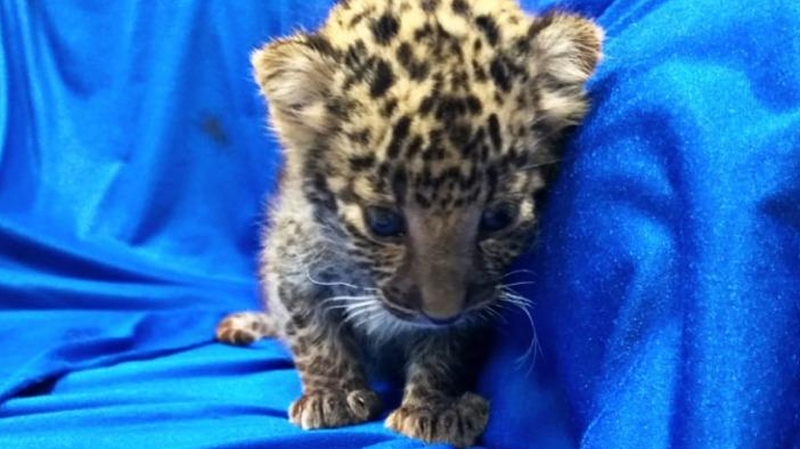 The officials of Wildlife Crime Control Bureau (WCCB) identified the cub as leopard cub of “Panthera pardus” specie. A vertinery doctor from Arignar Anna Zoological Park said it was an one month old cub weighing about 1.1kg measuring 54cm from nose to tail. The leopard cub and the Moideen were handed over to Tamil Nadu Forest Department for further action, Chaudhary said. The cub will be rehabilitated at the Arigna Anna Zoological Park. Moideen will be charged under the Wild Life Protection Act, 1972.